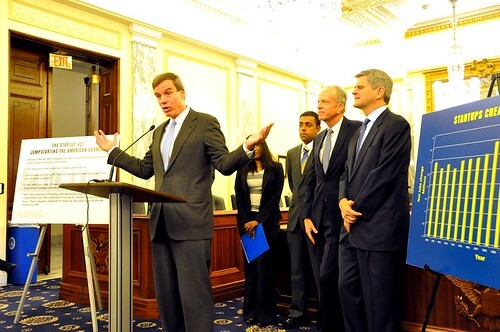 WASHINGTON -- U.S. Sen. Mark R. Warner (D-VA) today introduced bipartisan legislation that would update regulatory and tax policies to encourage entrepreneurs and innovators to launch new companies, creating jobs and broadening economic opportunities. Today's initiative builds upon bipartisan legislation Senator Warner introduced last week that is designed to make it easier for growing companies to access investment capital. Last week, Senator Warner also introduced bipartisan legislation to make it easier for small and medium-sized companies to access investment capital. The Reopening American Capital Markets to Emerging Growth Companies Act of 2011, co-sponsored with U.S. Sens. Pat Toomey (R-PA), Mike Crapo (R-ID) and Charles Schumer (D-NY), would reduce hurdles to an initial public offering (IPO) by phasing-in many of the costliest obligations over time while also maintaining key investor protections. "We need to make it easier for companies to go public because 90% of jobs are created after an IPO," Senator Warner said. "When AOL went public, it had 100 employees, and a decade later it had 10,000 employees. We need to make the smart policy choices now that make it less burdensome for start-up companies to grow responsibly and create new jobs."